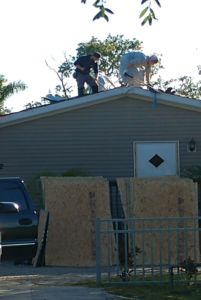 The Mennonite Disaster Services (MDS), in partnership with Rural Neighborhoods and the Immokalee Unmet Needs Coalition, recently completed critical repairs to a home that suffered roof and interior damage from Hurricane Irma. The house was inhabitable due to holes in the roof and ceiling where water came through, damaging furniture underneath. Thanks to MDS, however, the roof was replaced the drywall was repaired, and the homeowner was finally able to return home after living with her son since the storm struck. 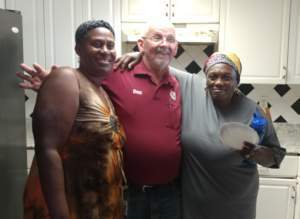 Don Mintmier of MDS with homeowner and relative. Her house was one of 23 homes the volunteer group, MDS, worked on while here in Immokalee. The group arrived in early January and completed their final project last week before returning home for the summer. The Collier Comes Together Fund, held at the Community Foundation of Collier County in partnership with the United Way of Collier County, provided funding to the Coalition’s partner, Rural Neighborhoods, to cover the cost of materials. MDS is just one of the Coalition’s many partners. The Coalition includes a mix of local and national non-profit organizations, faith-based groups, Collier County staff, and interested residents who volunteer their time and resources to help families impacted by the storm. The Coalition currently has about 300 open cases in the Immokalee area and is working hard to find resources to help families.